Each project draws from a pool of top-notch actors, comedians, improvisors, musicians, technical directors, and designers. Kirsten is a professional actor and comedienne who has received acclaim for her work in theatre, film, television and radio. She is also a writer, director, producer and teacher. Since moving to Victoria, she has made her mark on the vibrant local arts scene. Kirsten has acted in more than fifty plays in theatres across the country. Highlights include QUIET IN THE LAND (Blyth Festival), THE BUZ' GEM BLUES (Lighthouse Festival) , WHAT GIVES?/ALL EARS (Teatro la Quindicina), EXIT OTHELLO (Workshop West), I OUGHTA BE IN PICTURES (Sunshine Festival) and ALLEYCATS THE MUSICAL (Hoarse Raven) - Ovation Award Nomination Best Performance Female. On Vancouver Island: THIS LITTLE LIGHT workshop (Belfry), EMERGE workshop (Theatre One); THE SECRET GARDEN (2014 & 2017), HANA’S SUITCASE(Kaleidoscope Theatre), SMALLTOWN A PICKUP MUSICAL(Theatre Skam), eleven CHORUS/LINE CABARETS (Gotta Getta Gimmick) and the 2017 premiere of BLACKSTONES & BATHTUBS Musical (Razzle Dazzle) in Nanaimo. She is represented for Film/TV by Lucas Talent, Canada's 2nd largest talent agency. She has played roles in REBOOT THE GUARDIAN CODE (Netflix/YTV), THE BRIDGE (Hallmark), GAME OF LOVE (UP TV), SO YOU SAID YES (Hallmark) , STRANGER IN THE HOUSE (Lifetime) and MARK & RUSSELL'S WILD RIDE (Disney). Kirsten frequently performs in comedy variety & stand up shows around Victoria. She Executive Produced/performed in SHE KILLS ME a national APTN-TV series starring funny women, and hosted/produced Victoria's 2014 FUNNY WOMEN FESTIVAL, and the 2015 season of THE MERRIDALE SHOWDOWN. Nominated for a 2014 M Award "Top Comedian", her stand up is heard on CBC Radio's LAUGH OUT LOUD. Kirsten is a founding member of Edmonton’s DIE-NASTY, the Canadian Comedy Award- winning improv troupe. She starred in and co-produced five seasons of SIN CITY THE LIVE IMPROVISED SOAP OPERA at Toronto's The Second City. The troupe was nominated for a Canadian Comedy Award and invited to the CHICAGO IMPROV FESTIVAL. A SIN CITY special aired on CBC-TV as LIQUID SOAPZ. Kirsten hosted the alt comedy show LUCILLE'S BALL as "Louise", headlined MARCH OF DAMES, did several one-woman sketch shows, and performed in numerous improv comedy and variety shows in Toronto. Kirsten teaches workshops in acting and improv in her spare time. She has taught at York University, Randolph Academy, Vancouver Theatresports, St. Albert Children's Theatre, The Second City Training Workshop Centre, Pacific Film and New Media Academy, Victoria Academy of Dramatic Arts and more. Ian has worked in the entertainment industry for three decades as a writer, producer and performer. Ian won the 2004 Stephen Leacock Medal for Humour for his novel VILLAGE OF THE SMALL HOUSES, and is co-author with brother Will Ferguson of the best- selling humour book HOW TO BE A CANADIAN: EVEN IF YOU ALREADY ARE ONE, which was shortlisted for the Leacock and won the CBA Libris Award for Best Non-fiction Book of 2002. Ian wrote and directed two dozen plays as Artistic Director of Edmonton's Union Theatre, as well as numerous sketch comedy shows such as SPRING THAW and P.S. YOU GOTTA WONDER. Ian is the creator of the live, improvised soap operas DIE-NASTY (Edmonton) and SIN CITY (Toronto) both Canadian Comedy Award nominees, as well as SIN CITY (Victoria). 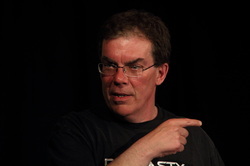 The five season run of SIN CITY Toronto included three years at The Second City, where Ian taught improv for the SECOND CITY WORKSHOP Training Centre. Ian was co-executive producer and live director for LIQUID SOAPZ (CBC-TV) and he directed four pilot episodes of a three-camera live sitcom and thirteen episodes of SHE KILLS ME for APTN. Ian is an award-winning playwright; he trained as an actor in the BFA program at University of Alberta, and holds an MFA in Theatre (Directing) from York University. Ian wrote and directed GONE SOUTH, a feature documentary about Canadians in Hollywood which has screened at a number of North American Film Festivals. Ian has several TV projects in development, and is also writing a non-fiction book. Ian sat on the board of the Greater Victoria Film Commission, and is a member of the Aboriginal Media Producers Association.